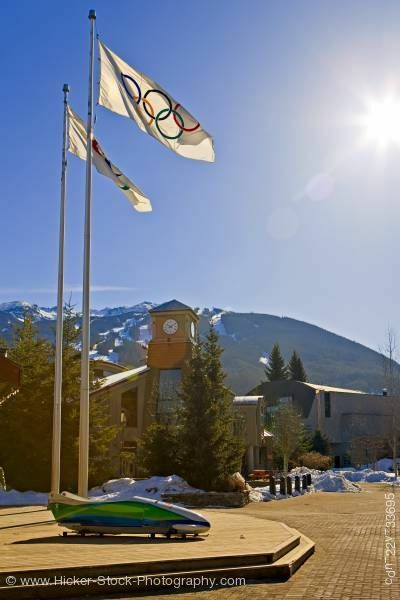 This stock photo includes the Olympic flags and official Vancouver 2010 bobsled outside the 2010 Olympic Office along the Village Stroll next to the BrewHouse in Whistler Village with Blackcomb Mountain (2440 metres/8000 feet) in the background, British Columbia, Canada. The Sun shines brightly in a clear blue sky upon this winter scene that shows where you can get all the information you need about the 2010 Vancouver Winter Olympic Nordic venue events that will take place in the Whistler Blackcomb mountain ski resort which has been expanded and upgraded for this Winter's games. Outside the office, visitors can get close up look at a Vancouver 2010 bobsled - a real one which is unveiled each day from its protective wooden box. The bobsled gives visitors an idea of what the athletes use to run the course and what little space they have to do it in.